Nowadays things have changed somewhat. The prospective owner needs to set himself aside for 2hr with a technician even to begin to understand what the product offers. With road test cars on loan it is not easy to remember all the gadgets that are available with the latest offering. Plus making sure where all the controls are. After seven days you might have noted all the plus points, and the bad ideas too! Such was the case with the Optima Sportswagon, exceptionally bedecked with, mostly, safety gadgets. There is the hands-free phone to organise with Andriod Auto and Apple CarPlay to sort out, and to consider whether the seat warmer should be used, plus the various radio stations to be (simply) set. Fortunately, the air conditioning is automatic. At one time in the not too distant past, a Korean-built car would never have been considered worth reporting on for a publication such as BTN. What were coming out of the motor factories of the Far East were poor copies of long forgotten Austin and Morris models, which themselves were not very good and obsolescent even then. How times have changed. Kia is Korean and proud of it. There is probably a Kia dealer near you. All the cars come with a seven-year, 100,000-mile warranty and in terms of technology compete with the best. The warranty is fully transferable should the car be sold before the time or mileage limits have been reached. And just when you think the old-fashioned estate car has had its day, along comes the Optima Sportswagon based on the excellent saloon of the same name. In fact it is the same length and width, but with integrated roof rails for styling making it is slightly taller. But it looks and feels much bigger. The top of the range test car was very comprehensively equipped with electric tailgate and an auto seat for the drivers that moves back as you open the door. There is a pair of preselected positions available, ideal if the car is often driven by two drivers but the steering wheel setting is manual. It is clearly aimed at the very large sales representative market, a real fully employed car for long distance travel during the week, and a smart family runabout at the weekend. The interior is well thought out with modern hard wearing materials that will be very good at resisting wear for many years. All in all, it is a fine product for the working day, and for carrying the children at the end of the week. The Optima Sportswagon was designed in Europe and is sold only in Europe. And to emphasise that theme, it is powered exclusively by Kia’s 1.7-CRDi turbodiesel engine, which develops 139bhp and 340Nm of torque. This engine was planned at Kia’s European research and development centre in Germany and features high-pressure common-rail fuel injection for maximum efficiency and a variable-geometry turbocharger to enhance low-speed driveability while ensuring strong top-end power. The net result is a car that in seven-speed automatic form does 0-60 in a fraction over 10 seconds and gives more than 55 mpg. The top speed of 125mph is purely academic. The Optima Sportswagon comes with Hill-start Assist Control (HAC), maintaining brake pressure for two seconds after the driver releases the pedal to ensure smooth transitions when setting off on inclines. No rolling back when the handbrake is released. The centre console of the fascia is angled at 8.5deg toward the person behind the wheel. However, our big grumble is using the car at night, or at least until one gets used to it. The various fixed controls, from those on the central console and the dashboard itself and in the door are difficult to see in the dark and need to be better illuminated. This is not just a fault with Kia. Most cars suffer from this problem. 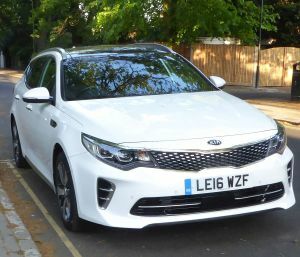 Kia offers value for money and essentially three Optima Sportswagon models. The entry-level manual comes as standard with a 7in satellite navigation screen and a reversing camera, steering wheel-mounted controls, front and rear USB ports, dual automatic air conditioning with ioniser, a leather-trimmed steering wheel and gear change, cruise control with a speed limiter, electrically heated folding mirrors, a six-speaker DAB radio with MP3 compatibility and Bluetooth with music streaming. It has 17in alloy wheels, body-coloured door handles and mirrors, dual projection headlights with static cornering lights and LED daytime running lights, powered two-way driver's seat lumbar adjustment and remote central locking with a fold-away key, Electronic Stability Control and Vehicle Stability Management, Hill-start Assist Control, Tyre Pressure Monitoring and an Electronic Parking Brake. All this for £22,295. The mid-range car is also available with a 7-speed auto box and the driver's memory seat, heated front seats and dual projection headlights. The exterior is distinguished by 18in alloy wheels, and body-style changes. Additional driver aids include Lane Keep Assist and a noisy Speed Limit Warning; £26,440 in auto form. GT-Line S supplements all this with different design of 18in alloy wheels, a wireless mobile phone charger, a really splendid 360deg viewing system which can be used when stationary, a ‘smart’ parking assist, and rear cross traffic alert with a most audible bleeper. With this model, there is adaptive cruise control perfect for long motorway runs, and the powered tailgate. 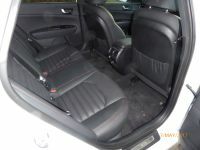 It has a tilting and sliding panoramic sunroof; £30,595 as tested. Electronic Stability Control and Vehicle Stability Management are standard. These can automatically counteract any loss of traction when cornering or setting off on surfaces with differing levels of grip from left to right. On the road, the Sportswagon is pretty effortless, no problem at all in the wet, and neat around the inevitable roundabout on main road routes. It is not going to win any traffic light GPs - as with any diesel, the pick-up is lethargic. Cars to compare it with include the Skoda Superb estate, which is a ‘build your own' product, capable of outpricing the Kia, plus the Mazda 6. The Germans offer some neat estate cars too with the Audi A4 Avant, Mercedes C-Class Estate and BMW 3 Series Touring, but you are in for more money and much less worry free warranty. 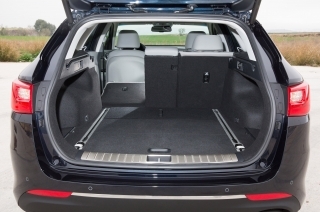 The Kia fits in nicely in what is known in the industry as the “D”-class market, a minimum of 552 litres of cargo space – plus the added option of dropping the rear seats to increase this to 1,686 litres. If you are looking for a decent estate car that has everything thrown in at a sensible price, it might be for you.